On Thursday afternoon, librarians at Oakland’s downtown branch chained up the front doors early to honor the beginning of a six-hour citywide strike by Oakland city workers—timed to coincide with Mayor Libby Schaaf’s annual State of the City address. “We’re striking now to drive home that the state of Oakland isn’t all roses,” said Lina Hernandez as she left the building with her fellow librarians and Service Employees International Union (SEIU) members. “We are severely understaffed,” she added. She and her fellow union members have been without a contract since June 30. The strike set the stage for competing narratives about Oakland—the mayor’s upbeat, resilience-themed State of the City address, which she held in the Islamic Cultural Center of Northern California, and “The Real State of Oakland,” a rally held on the streets outside by frustrated and outspoken union members, community activists and their allies. Over 250 people attended each event, and Councilmembers Noel Gallo (District 5) and Desley Brooks (District 6) joined those rallying outside. Workers with both SEIU 1021 and International Federation of Professional & Technical Engineers (IFPTE) Local 21 had marched to the Islamic Cultural Center—which Schaaf chose as the location for her address in response to President Donald Trump’s immigration ban targeting people from Muslim-majority nations—well ahead of the mayor’s event in order to form a picket line in front of both entrances. The crowd shouted “Shame! Shame! Shame!” and “Don’t cross the picket line!” each time an Oakland police officer ushered an attendee into the mayor’s event. Some chose not to enter and joined the picket line. The unions represent a range of city workers, including building inspectors, librarians, and sewer maintenance technicians. At about 6 pm, inside the main hall—where the outside chants of “What do we do? Stand up! Fight back!” were reduced to a quiet muffle—the center’s board president Dr. Payman Amiri told the audience it was his “greatest honor” to host the mayor’s annual speech. “I realize how hard it is to be a servant of a community,” he said to the audience. After music and dance performances by Ballet Folklorico, Aswat Ensemble—an Arab-American music group chosen to perform in response to Trump’s attempts to ban travelers from Middle Eastern countries—and the Hung Sing Lion Dancers, Schaaf launched into a speech on homelessness, housing affordability, policing, road repair, education and city workers. After praising the creation of Oakland’s new police commission—a charter amendment passed by Oakland voters in 2016—she said that use of force incidents were down 77 percent and complaints about Oakland police were down were down 58 percent. “Oakland is on track to see its fourth consecutive year of fewer robberies, shootings and homicides,” she said, also crediting the work of Ceasefire life coaches, the number of which she plans to triple next year. Ceasefire is a partnership between police, churches, social service agencies and residents to reduce violence on Oakland streets. She touted Oakland’s plan to create 40 “Tuff Shed” outdoor shelters for homeless residents and shared the city’s plan to build a second Henry J. Robinson Center, which houses homeless people and helps them transition into permanent housing. The current center, she said, successfully transitions 87 percent of the approximately 300 homeless people they serve each year into permanent housing. She also called on Oakland residents to open up rooms to those without a home. She brought on stage Fatima Washington, a woman who has experienced both incarceration and homelessness. After connecting with the Henry J. Robinson Center, Washington was offered housing in Oakland resident Miriam Martin’s in-law unit, and she now has a job at UPS. Schaaf asked Oakland residents to contribute 100 new rooms or housing units for the homeless in the next year. “Give up that Airbnb. Fix up that back unit,” she said. On the question of housing affordability, she promoted her “17k/17k” plan to build 17,000 new units and protect 17,000 households from displacement by the year 2024. Housing affordability is a regional issue, she said. “For the last several years, the Bay Area has been building only one unit of housing for every eight new jobs,” she said. Measures KK and A1—passed by Oakland and Alameda County voters respectively in 2016—will add $200 million dollars for affordable housing in Oakland, she said. “This budget that we just adopted has 12 times the funding for affordable housing as our last budget,” she added. She also said she is nearing $40 million in private investment in the Oakland Promise, her initiative to provide scholarships and college-readiness support to Oakland students, and that city workers were on track to fill 22,000 potholes and triple the repaving of Oakland streets. Outside, protestors told a less positive story. SEIU’s strike stems from unfair labor practice grievances the union recently filed with the Public Employment Relations Board, a state agency, alleging that city officials are not bargaining in good faith and are changing workers’ shifts without conferring with the union. On the picket line Thursday, workers also cited low wages, overuse of insecure, temporary part-time jobs, understaffing, and poor and unsafe working conditions as urgent issues the city has not adequately addressed. About half of SEIU workers are temporary part-time workers, she said, which means they can be terminated at will, paid less for the same work as full-time workers, and often forced, by economic necessity, to take a second job. Their unstable employment situation creates a lot of chaos and stress on permanent staff as well, she said. “It makes it next to impossible to function properly,” said Alma Garcia, a full-time front desk librarian at the downtown branch. The city has offered a two percent wage increase each year for the next two years, but David Velez, a building inspector in the planning department who is also on the negotiating team, says that it wouldn’t be retroactive for the six months city workers have been without a contract. The mayor’s communication director, Justin Berton, did not offer comment on this matter when reached Friday by phone. 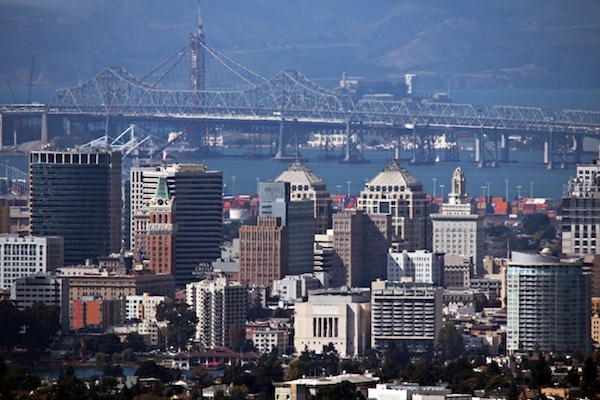 Cuevas also said it’s not enough to keep up with cost of living increases, which for the Bay Area has officially hovered between three and four percent in the past year, according to the Bureau of Labor Statistics Consumer Price Index. Other protesters declared their opposition to the Oak Knoll project, a major development of 935 new housing units in the East Oakland foothills, none of which are affordable, as well as the Oakland A’s plans to build a new stadium adjacent to Chinatown, Eastlake, and Laney College. Community organizer Alvina Wong, of the Asian Pacific Environmental Network, said it will bring more market rate housing and displace working class communities. Alma Blackwell, of Causa Justa :: Just Causa, a tenants’ rights organization, said that the mayor and the city have not adequately funded the new tenant and eviction protections created by Measure JJ, passed by voters in 2016. “Mayor Schaaf, you have failed us,” Blackwell said, speaking to the crowd outside. In her address, Schaaf acknowledged the union picket line taking place outside. “Our employees are exhibiting Oakland values,” she said, referring to the strike. “I deeply respect that. I want to give every city worker a round of applause,” she said. She did not offer a comment on SEIU’s contract, but after her speech, her communications director, Justin Berton, said she “feels good” about the ongoing negotiations. The union and city will have two regularly scheduled bargaining meetings next week. “We hope that they show up ready to bargain,” said Cuevas, speaking by phone Friday. Oakland city workers with SEIU 1021 march outside of Mayor Libby Schaaf’s annual State of the City address. The Aswat Ensemble performs before Mayor Libby Schaaf’s State of the City address, which was held at the Islamic Cultural Center of Northern California. Mayor Libby Schaaf delivers her annual State of the City address. Mayor Libby Schaaf embraces Fatima Washington, a formerly homeless woman who was offered housing in the in-law unit of Oakland resident Miriam Martin. Mayor Schaaf is calling for 100 more Oakland residents to offer a room or in-law unit to people transitioning out of homelessness. Mayor Schaaf says that Measures A1 and KK have created $200 million dollars for affordable housing in Oakland, beginning to replenish what was lost when California eliminated redevelopment agencies. What do the unions actually want? Higher taxes? Closing some library branches so it’s easier on them? Cutting some other projects and programs? What do they propose to cut?